If the booking is to be cancelled or there is a change in numbers of people, please advise Chhayya hotel at least 1 day before. The security deposit is non-refundable, even if the booking is cancelled or there is a reduction in numbers. A security deposit of 50% of the total charge is payable before arrival. 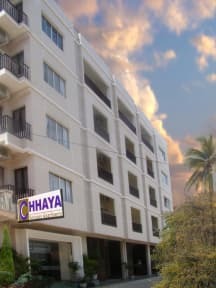 As soon as Chhaya Hotel receives your credit card / bank account details we will charge to it the 50% security deposit. If the booking is made for an arrival within 7 days or less a 50% deposit of the total charge is payable immediately. As soon as Chhaya Hotel receives your credit card / bank account details we will charge to it the 50% security deposit. Our friendly hotel is located in the city centre nearby the Psar Nut market and a few minutes walk away from the river. We offer 100 clean and well kept rooms.We also have 60 self contained apartments (starting from $20). Free Coffee in Morning. FREE use of computers,FREE wifi,FREE drinking water and FREE pick up from the bus and the boat station (Email us beforehand with details of your reservation number,time and place of arrival). Very good location, we arranged trip to Siem Reap at the reception (by boat) for good price. Room was ok, included breakfast was very poor (baguette solo and tea/coffee), even no plates provided. Stuff ok but we had small problems with communication in English. For one night - just to sleep - it's ok. Pretty decent atmosphere, room was spacious and equipped with soap and toothbrushes and paste and comfortable cushions however could have been a little cleaner - couldnt leave any food in the room as we had an ant problem! Staff were really friendly and helpful and the free coffee and bread in the morning was a great bonus. Security was good, we stayed in a private room and had keys and security were roaming the corridors at night. Good location near the river, market and restaurants. An ok hotel for couple of nights stay! Is cheap & good location! Manager is really nice, and in the morning he offers you free coffee/tea. Also free water refill (which is big thing if you backpack). Major con, is the noice in the corridors in the morning and late afternoon! Nice stay. Can't beat the price but did have a few ants in our room and a found a few hairs (which definitely wernt ours) on the bed sheets but this was quickly sorted. Staff were nice and helpful and the breakfast was a nice added touch. I would stay again. 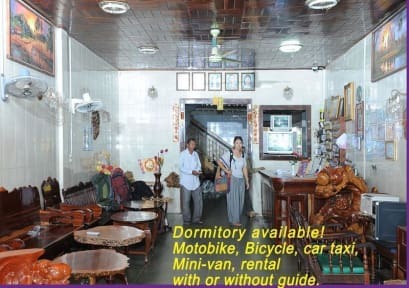 Cheapest hostel in Battambang. Althpugh the breakfast was not included the owner gave us coffee and bread. The owner is nice. The beds are ok. But the fan didn't reach the bottom beds. The toilet was not as clean as we would have liked to, but in general ok for 1 night. The rooms are somewhat clean and it's in the central location of the city. That being said being woken up at 6am and asked where I will be going today isn't exactly the best wake up call. The free breakfast consisted of a baguette and tea/coffee. The manager was insistent that our travel plans were wrong (they were right) reception wasn't really that accommodating. The hotel could be a great hot-spot for travellers, though the staff and additional lack of facilities let it down. The hotel is pretty dated, our room was unclean and the staff were unhelpful. But it was cheap, the shower worked, free WiFi in your room and it was in a good location. If you’re not planning on spending much time in the hotel like us, then it did the job. Good for backpackers wanting their own space. Narrow dorm, no lockers. There is no window between dorm and corridor so that you hear all the noise from the hostel guests and staff. And everybody can open the door from outside, so the room key is actually worthless. The dorm too small and there is no space for luggage. It is very hot inside and the fan is so loud. The shower and toilet are not separated and obviously the hostels staff as well as the cleaning women use the same bathroom. Honestly the dormitory remind me of a prison cell.